Slide-In Dual Fan Mount for Zortrax M200 by JuliaTruchsess is licensed under the Creative Commons - Attribution license. eliminates the crossbar behind the hot end, which makes removal of the fans unnecessary when changing the hot end. It's a better way. NOTE: This is a work-in-progress, and there are some known issues. Some M200s only have three mounting holes in the heatsink. The slide mount is too tight. Some walls are very thin and fragile. I will continue refining the design as time permits. ccc's wonderful dual fan mount has become a classic and is a must-do mod for the M200, improving part cooling tremendously, not to mention making your printer look extra-badass as well. 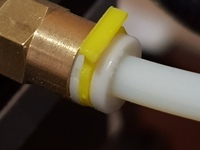 The support bar for the left fan, however, tends to be in the way when doing extruder maintenance, and removing the fan(s) on the M200 is a real pain, involving awkward angles with hex drivers under the heatsink, and a loose spacer part. This Thing features two "rails" mounted more less permanently to the heatsink, and a duct part to which both fans are mounted. 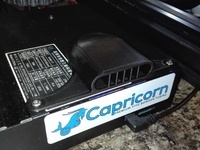 The duct simply slides to the rear of the printer along with both fans whenever extruder maintenance needs to be done. One thing to be aware of is that you must have enough slack in the right fan wiring to move it back and forth freely. I heartily recommend Noctua fans for this application - they're quiet, reliable, blow just the right amount of air, and they have recesses for the mounting bolt heads. I printed the parts in Z-ABS for heat resistance, easy support removal, and a nice matte finish. Print the duct part with a 10-degree support angle so you don't end up spending a lot of time digging support out of the ducts. Print the rails with no support. Screw the rails to the underside of the heatsink with M3x4 or M3x5 machine screws. 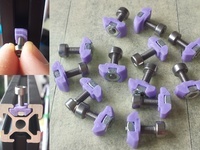 The screws need to have low-profile heads in order to clear the fan; most panhead screws will be fine. Mount the rails with the open ends of the slots toward the rear of the printer so the duct part slides in from the back. You need to use fans (at least the right-hand one) that have recesses for the mounting bolts so that the bolt heads are flush with or below the top edge of the fan. The Noctuas have this, I'm not sure about other brands. 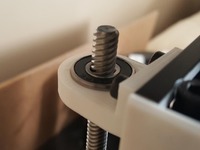 You can use M3 or M3.5 self-tapping screws, or you can tap threads and use regular machine screws, or use machine screws and pretend they're self-tapping. You can even just sit the right-hand fin into its "bucket" and not use any screws - it's trapped between the duct and the rails anyway, and not going anywhere.